Food Costs > How Much Does a Cheesecake Cost? How Much Does a Cheesecake Cost? Cheesecake is one of the many desserts that can be served at home or in restaurants after a meal. There are also some restaurants, such as the famous Cheesecake Factory, that actually revolve around this delicious treat. Most of the cheesecake served in the United States uses cream cheese, ricotta and quark, and debates have been held as to whether cheesecake should be categorized as a cake, torte or custard. Greeks considered it to be cake, while others call it a torte because of the number of eggs used. Others still refer to it as custard pie because of the crust, lack of flour and the soft filling. How much does cheesecake cost? Depending on the size of a cheesecake, the costs will vary anywhere from $17 for a seven-inch cheesecake at the grocery store to as much as $55 for a premium 10-inch cake at a higher-end bakery. Purchasing a slice at a local restaurant can cost $3 to $8 per slice, which can greatly depend on the restaurant you’re visiting. A diner, for instance, will be much cheaper than a five-star restaurant. For example, slices at The Cheesecake Factory can cost $6 to $8 per slice, depending on the flavor, according to this scanned menu. The online cheesecake retailer, Cheesecake.com, has a variety of nine-inch options, ranging from $42 to $55. On this GardenWeb.com forum thread, someone asked what they should charge for their homemade cheesecake, and according to the responses, forum members said, after expenses, should charge three times the ingredient cost, which, can be up to $54. If you are going to bake the cake yourself, the average cake can cost $14 to $16 when the ingredients are factored in; however, if you were to use a box mix, the costs could be much less. On average, a box of cheesecake mix can cost from $2 to $6 depending on the brand and the store selling it. A frozen cheesecake purchased in the grocery store can cost $5 to $10. 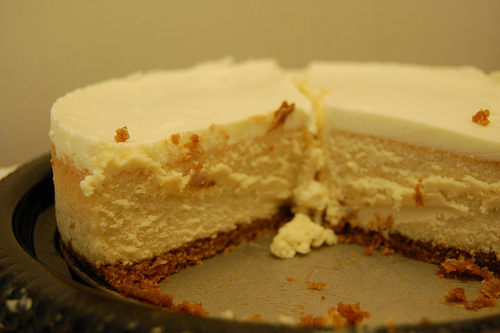 Cheesecake consists of two or sometimes more than two layers. The significant layer, or the thickest layer, is made up of a mixture of fresh cheese, sugar and eggs. The bottom layer is made from pastry, grounded cookies or sponge cake in some occasions. Normally, cheesecake is sweetened with sugar and can be topped with fruit, nuts or even chocolate syrup. If you purchase a frozen cheesecake or a whole cheesecake from a grocery store or a bakery, it will usually be either pre-cut or at least have a guide for where to cut each piece. Flavors, regardless of where you purchase it, can range from toffee, key lime, strawberry, or chestnut that can be used to prepare cheesecake. Other popular types include New York, Pennsylvania Dutch, Philadelphia, Farmer and Chicago Style. If you purchase a box of cheesecake mix, it will usually come with two separate packages. One will contain a graham cracker crust mix, which will need to be mixed with melted butter and spread on the bottom of whatever pan or dish you are using. The other package will contain the cheesecake mix, which will be combined with milk and maybe a few other things to make the cheesecake. Of course, making cheesecake from scratch will always be the cheapest option. In fact, theKitchn.com did a study, comparing the prices to a frozen cheesecake, The Cheesecake Factory and a homemade cheesecake. In the end, a homemade cheesecake cost an average of $1.09 per slice, while a slice at the local Cheesecake Factory would cost $2.99 per slice if a whole cheesecake was purchased at once. As a grocery store bakery alternative, check out your local farmers market to see if any vendors are selling cheesecakes.